Zelda is such a classic game that so many gamers hold dearly to their heart. The earlier artbook The Legend of Zelda: Hyrule Historia is the only video game artbook that I know of that has over 2,000 reviews on Amazon. Not everyone writes a review, so can you imagine how many people bought that book? The Legend of Zelda: Art & Artifacts, also published by Dark Horse, is destined to do well too. For once, there's now an authoritative art companion. First of all, there's going to be some duplication of artworks if you have the other artbook. But it's not a big deal. This new book has 428 pages of content! And there are lots of previously unseen content. On its own, it's a must buy for all Zelda fans. Even if you have the earlier book, it's still worth getting this book because there is just. So. Much. Art. This book has artworks from the first ever game The Legend of Zelda to Tri Force Heroes. These are full coloured poster style illustrations. The bulk of the book features character designs. I love all the characters, NPCs and the enemies too. You can see Zelda in different styles and just look at how the artistic style has evolved since the game was first released in 1986. There's more than 30 years of art collected in this book. There's actually not a lot of artifacts featured, strangely, or maybe I expected more. Other art you'll see are the pixel art, logo designs and packaging art. Right at the end is an interview with four artists from Nintendo. Oh, there's also a bonus art gallery for Breath of the Wind which I hope will have a dedicated artbook. This is an incredible companion. It's a must buy for Zelda fans. It's really worth the money. 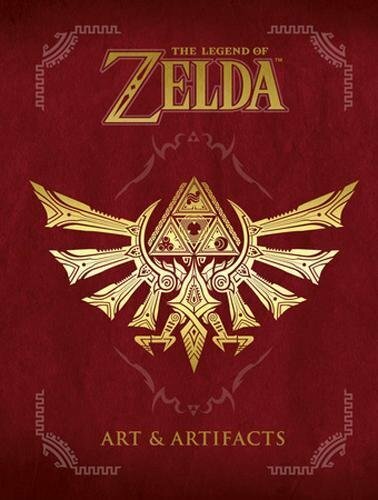 Hi, between this artbook and the first one, hyrule historia , which one would you suggest if we speak artwork wise ? For art, go for the Hyrule artbook. Check out the page-flip videos I've included at the end of each review to compare.